A few weeks ago I wrote a post about our soon-to-be arriving goats, Martha and Rufus. Since then things have changed a bit and I haven't written about it before now because it's all been rather sad and unresolved. But I am getting over it now and have some happier news, so here's what has been happening. Nearly four weeks ago now, just 10 days before Martha and Rufus were due to move in, a terrible accident happened at Canon Frome Court, their current home. Along with the herd of older goats, Martha and Rufus escaped from their yard and they all got into their feed bin. It is very dangerous for goats to overeat on their rich concentrated food and they were all very poorly indeed. All the older goats and Rufus responded to treatment and pulled through, but very sadly Martha passed away the next day. It was all terribly upsetting and sudden. And to make matters worse, I had been there in the morning of the accident, milking and looking after them all, so it was almost certainly my responsibility for not closing a bolt properly. Everyone at Canon Frome was so lovely but you can imagine the guilt and the grief. Well, since then some decisions have had to be made. Firstly we delayed Rufus coming here on his own, it wouldn't have been fair on him. And then we set about finding him a new companion. Initially I looked for another female goatling (last year's kid, like Rufus) but they are few and far between, then I looked at older milking nannies but decided I wasn't ready for the twice-daily milking commitment yet. So in the end I settled on a little kid, one of this years. But as little kids are so, well, little it wouldn't be wise to put such a baby in with Rufus straight away (even though he is a gentle, neutered and not-very-big 10 month old boy). So - upshot is I am having two little girl kids. And Rufus. As I write Mike is busy transforming the goat shed into something that will house the two kids in one pen, and Rufus in the next. They will 'run together' (goat speak) in the yard / fields when I am around to supervise, and hopefully they will all share a pen one day when the kids are bigger. They are all arriving on Thursday. First we drive down to Wales to pick up the girls (a box in the car will be fine for them), then come home via Canon Frome Court to hook up a stock trailer for Rufus. So we should be arriving with all three of them around teatime Thursday. It's been a quite a journey, these last few weeks, and I am so looking forward to them all arriving. At last. So sad, but these things happen. It's been a recurrent theme through our change to being country folk with birds and animals, it's the little things you do or don't do that cause upset and heartache. But it's a good thing we all learn from our mistakes and they don't happen twice. How nice that you are having a little herd of three goats, no doubt they will all get on fine once they get to know each other. I wish you lots of luck with them and hope Mike manages to make a good escape-proof goat enclosure, they will soon let him know if he doesn't !! 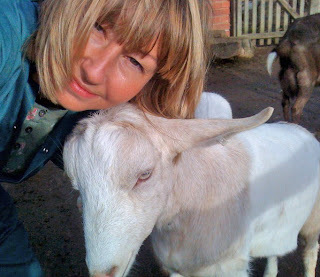 Very sad about the goats all getting ill and poor Martha! It will be lovely to have the two girl kids and Rugus though. And 'rabbit goats', how adorable! Oh Charlotte, so sorry to hear about Martha. Accidents happen, we are only human. Please don't feel bad.